Does the Protestant Reformation still matter? If so, why? These are important questions, especially in our day and age, because for many living today in the twenty-first century, what is important is not the past, but the future. We live at an unusual time in history. In terms of technology, the world has changed faster in the last one hundred years than it did in the previous two thousand years combined. This has affected us in many ways. Our generation no longer looks to the wisdom of the past for guidance; instead, we look for the next new invention. History is “yesterday’s news.” What matters is tomorrow. Sadly, the same way of thinking has influenced Christians. We look at church history with a jaundiced eye, finding it boring or irrelevant, but we must understand that this is an unwise approach. God has always called his people to remember his gracious works in the past. Israel was called to remember the exodus. Christians are called to remember the death of Christ. The same principle holds true with the lessons of church history. It has been rightly said that those who do not learn from history are doomed to repeat it. The church simply cannot afford to forget the lessons of the Reformation. There are hundreds of books on the Reformation, but if one coming to the subject for the first time were looking for the best place to start, he would be hard pressed to find a better introduction than Stephen J. Nichols’ The Reformation (Crossway, 2007). For those who find history difficult, Nichols’ style of writing is a breath of fresh air. He does not fill page after page with dry lists of names and dates. Instead, his gift is the ability to draw readers into the lives of the people about whom he writes, allowing us to see these great historical figures, warts and all. Nichols’ book features eight short chapters, each containing numerous illustrations. As is the case in many Reformation histories, the chapter topics of Nichols’ book are devoted to the various “branches” of the Reformation. 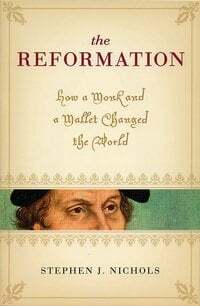 Thus, there are chapters devoted to Luther and the reformation in Germany, Zwingli, the Radical Reformers, Calvin, and the English Reformation. However, unlike some books on the Reformation, Nichols also includes chapters on the Puritans, and on significant women of the Reformation. In his chapter on Luther, Nichols offers a sketch of the important events that led up to Luther’s break with Rome, but he does not lose sight of Luther the man in all of this. We must remember that the Reformers were not ivory-tower theologians, discussing doctrines in the peace and quiet of a modern academy setting. No, the Reformers did their theology in the trenches, and Luther is no exception. Nichols describes Luther’s personal struggles in a way that helps readers understand more fully not only what Luther did, but why. He also describes Luther’s sense of humor, and his deep love for his wife Katherina. In this way, Nichols helps us to understand that Luther was not a superhuman being. He was a man providentially placed by God in the midst of extraordinary circumstances. The same style of writing is evident in the remaining chapters of the book. We find the Reformation initiated in Switzerland during a sausage supper in Zurich with a notable young priest named Zwingli present. We discover the origins of the Anabaptists, those Christians whose convictions concerning baptism and the separation of the church and state often resulted in their martyrdom. We encounter the young John Calvin, whose overnight stop in Geneva on his way to Strasbourg ultimately changed his life and the course of church history. We see the Reformation gain a foothold in England as a result of a king’s desire for a male heir. In all of this, we are introduced to a fascinating and diverse cast of characters, from the soul-searching Martin Luther to the soul-selling Johann Tetzel, from the non-compromising John Knox to the pragmatic Thomas Cranmer. In his chapter on the Puritans, appropriately titled “Men in Black,” Nichols clears away centuries of misrepresentation. He describes the roots of puritanism in the ups and downs of the reformation in England, agreeing with one scholar that puritanism was the “real English Reformation.” In his concluding chapter, Nichols introduces us to some of the unsung women of the Reformation, the wives of the Reformers as well as women who made significant contributions to the Reformation on their own. The church must not forget the lessons learned during the Reformation. We cannot forget what happens when the Gospel is obscured and distorted. The Reformation does still matter. Read Stephen Nichols’ book and discover why.